This product has reached end of life. Please contact Linx Sales or Customer Service for further details related to this notice. The TT Series RF remote control transceiver module is designed for reliable bi-directional, long-range remote control and sensor applications. All remote control functions are integrated, so a basic system can be created without any programming. Operating in the 900MHz band, it makes use of Frequency Hopping Spread Spectrum (FHSS) technology, which gives it more immunity to interference and allows a higher transmit power. This gives the RF remote control transceiver module longer range than non-spread spectrum devices and better performance within that range. The base version is capable of generating +12.5dBm transmitter output power and achieves a range of over 2 miles (3.2 kilometers) line of site in typical environments with 0dB gain antennas. A high power version outputs +23.5dBm achieving up to 8 miles (12.8km). The TT Series has 8 lines that can be configured as either inputs for buttons and sensors or outputs to drive circuitry. It has built-in acknowledgements that indicate the receiving side got the commands. Primary settings are hardware-selectable, which eliminates the need for an external microcontroller or other digital interface. No programming is required for basic remote control operation, but it has a serial UART interface for more advanced operation. 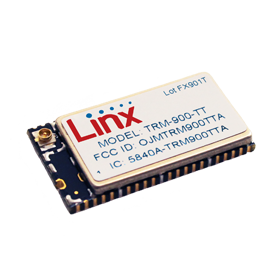 The TT Series can also transmit two bytes of data which can be provided by an external microcontroller. This data can consist of sensor values or additional command or control information. Simple serial commands are used to load the values into the module through the UART interface. The TT Series transceiver has obtained modular approval for the United States and Canada.